Residents of Norway's Svalbard Islands are used to dealing with the dangers of polar bears but, for one remote settlement, wild animals are not the only worry. Should you have the misfortune to fall gravely ill, you can expect to be despatched by aeroplane or ship to another part of Norway to end your days. And if you are terminally unlucky and succumb to misfortune or disease, no-one will bury you here. The town's small graveyard stopped accepting newcomers 70 years ago, after it was discovered that the bodies were failing to decompose. Corpses preserved by permafrost have since become objects of morbid curiosity. Scientists recently removed tissue from a man who did die here. They found traces of the influenza virus which carried him and many others away in an epidemic in 1917. 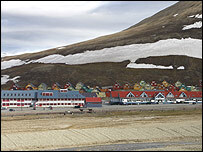 Longyearbyen's "no death" policy stems as much from its remote location as from its harsh climate. At 78 degrees north, it lies on the archipelago of Svalbard, a group of islands between Norway's northern coast and the North Pole. About 1,500 people inhabit small wooden houses which are partly sheltered from the Arctic winds by the settlement's location in a mountain valley. Kristin Grotting is a physiotherapist, who moved here 12 years ago. Her naturally light complexion has been reddened by the constant summer sunlight. The Arctic day lasts from March until October but it never gets very warm and, on the day we met, Kristin kept her thick coat zipped tight. Looking out towards Longyearbyen bay, she explained that the Icefjord - as it is known - has stopped being icy. Even in midwinter, the water no longer freezes and the glaciers around it are receding. "We used to be able to take our snowmobiles right across that fjord," she told me. "Now we can't do that any more and we have to go the long way around." Global warming is not her only concern. She also worries about what she will do when she retires, as this community has no facilities to care for the old or frail, hence perhaps its entrenched fear of death. But although there is no old people's home, there is a kindergarten. In winter - when the darkness lasts for months on end - the children make images of the sun with yellow paint and tissue paper and stick them to the windows. Kristin has met some of the children at her physiotherapy clinic. She says they have developed mobility problems because of their heavy winter clothes and must be trained to stretch their limbs in the warmth. Trips outside the kindergarten's walls carry a more immediate danger for the children and, for this reason, the teacher carries a gun. 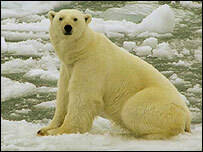 Longyearbyen is in the land of the polar bear, an animal which causes real dread among its residents. Every student at the university spends their first day learning how to shoot bears. Aim toward the chest, runs the advice, rather than the head which is easy to miss. If you are unarmed when you encounter a bear, toss your mittens on the snow in the hope of distracting it. But if you see it snap its teeth with a smacking sound, it is readying for a kill. At which point, I suppose, you could try reminding the bear that it is forbidden to die in Longyearbyen and hope it shows respect for local law. Hunting for polar bears is strictly forbidden and, if you do shoot one in self-defence, you must inform Svalbard's governor, Per Sefland. He has a large stuffed one in his office, which he assured me he did not shoot himself. In fact, it is the governor's enthusiasm for wildlife that led him to take this remote posting, after working for the state prosecutor's office as a lawyer in Oslo. He also has an interest in graphic design and showed me a special road sign designed to emphasise the polar bear threat. Like other hazard signs, its red triangle signals potential danger. But the inside has been shaded black so that the image of a large white predator can be easily seen by passing motorists. The governor drove me past the sign in his 4x4 to see the town's huskies. When not working with a sled team, the dogs live in large cages overlooking the fjord. They eat seal meat provided by local fishermen. A colony of Eider ducks has made its home between the husky kennels, about 100 pairs in all. Mr Sefland told me the birds chose that spot because Arctic foxes, which prey on young ducks and eggs, are scared of huskies and will not intrude. Seeing the duck feathers on the frosty ground made me think of eiderdown and I imagined how cosy it must feel to snuggle beneath a quilt to escape the polar cold when the season turns to winter. Perhaps even with a cuddly toy - although not, I think, a white teddy bear, which could provoke bad dreams throughout an Arctic night which never seems to end. From Our Own Correspondent was broadcast on Saturday, 12 July, 2008 at 1130 BST on BBC Radio 4. Please check the programme schedules for World Service transmission times.